In February, Facebook gave $200,000 to The Committee to Protect California Jobs, a business-backed political action group dedicated to defeating a state ballot initiative that would expand Californians’ privacy controls. Just what “reasonable privacy measures” might mean to Facebook remains to be seen, but the company's state-based lobbying efforts are the subject of fresh scrutiny following Zuckerberg's testimony. Mary Stone Ross, president of Californians for Consumer Privacy, the group behind the ballot initiative, said Facebook’s move is a positive step but that the company will need to do more to show that it’s truly changed its ways. Of the decision to pull out of the California group, a representative for Facebook told NBC News: “We have no further information to offer at this time.” The representative declined to shed light on whether Facebook was currently involved in any other efforts to oppose privacy legislation in California or any other state. In recent days, Facebook has made a number of privacy-strengthening changes to its social network including limiting the data that can be gathered by apps that people connect to their Facebook profiles. The company also discontinued features that were vulnerable to abuse, like the ability to search for profiles by phone numbers. It also announced that it would adopt the recommendations of the Honest Ads Act, which seeks to regulate online political advertising. Facebook’s support for user privacy, however only goes so far, particularly when it comes to government regulation. Facebook has responded to the prospect of federal regulation this year the old fashioned way: with money. In addition to its in-house team of lobbyists, Facebook spent more money on outside lobbying this year than it ever had before: $11.5 million on 11 different lobbying firms in 2017, according to disclosure filings analyzed by the nonpartisan Center for Responsive Politics. Facebook spent 2.4 million euros last year on lobbying the European Union, doubling its 2016 expenditures in the region where sweeping online privacy reforms dictated by the General Data Protection Regulation are about to take effect. At the U.S. state and local levels, Facebook’s activity and influence is less clear. It spent $404,200 on state lobbying in 2017 and $838,460 in 2016, according to the National Institute on Money in State Politics. But as the Center for Public Integrity has reported, Facebook prefers to influence state laws through trade associations. In at least one state, the social media giant has a definite interest, and a possible connection, to what privacy advocates are calling a move to “gut” an online privacy law. An Illinois law restricting the use of data from facial, iris, voice and fingerprint scans — a law known for being the first and strictest biometrics legislation in the nation — is currently under threat by a new bill currently that would grant exceptions to allow employers and retail stores to utilize the technology. As reported in the Verge, the bill threatening to weaken the 2008 Biometric Information Privacy Act is being co-sponsored by four lawmakers, each of whom have received campaign donations from Facebook in the last six months. Additionally, its being backed by the Illinois Chamber of Commerce, which has a technology council co-chaired by Dan Sachs, a Facebook lobbyist. In a statement to the Verge, a Facebook spokesperson denied having any involvement in the bill. 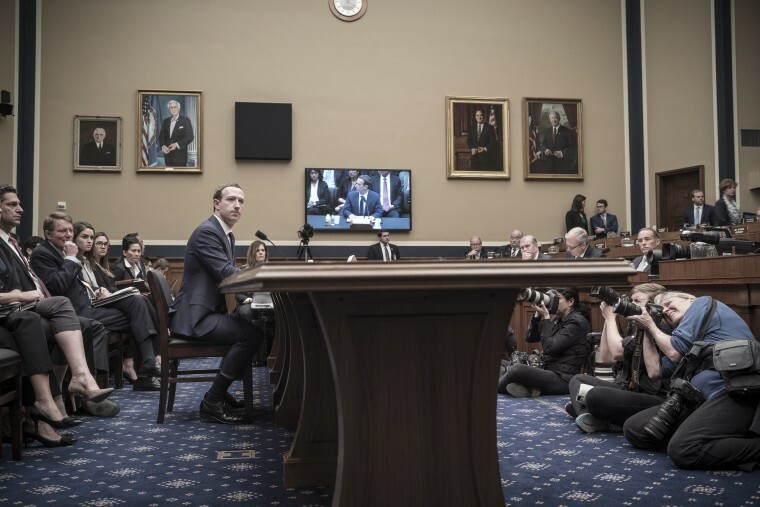 Senator Richard Durbin, D-Ill., brought up the legislation and Facebook’s influence during the Senate hearing on Tuesday. “I'm afraid Facebook has come down to the position of trying to carve out exceptions to that,” Durbin said, referring to the Illinois bill. “I hope you'll fill me in on how that is consistent with protecting privacy." Zuckerberg never answered, as Durbin’s time had run out.